The Beachconers opens in Britannia! Love the name! Love the location! And really love the small-batch ice cream! The Beachconers opened up its ice cream shop a few weeks ago on Britannia Road, just steps from the walking and biking paths leading to Britannia Beach and Mud Lake. Small-batch ice cream is delightful, with a dozen flavours on the menu each day — on our visit, the mojito was calling our name. But so was the snickerdoodle cookie and the rhubarb crumble. In the end, the ridiculously good rhubarb crumble won out, all buttery and cinnamon-y with a tart hit of rhubarb every second bite. The owners are almost finished renovating the adjoining coffeeshop (which will also serve baked goods). Look for The Beachconers to become a neighbourhood hangout. $3.80 for a small cone. 273 Britannia Rd., 613-829-9696. 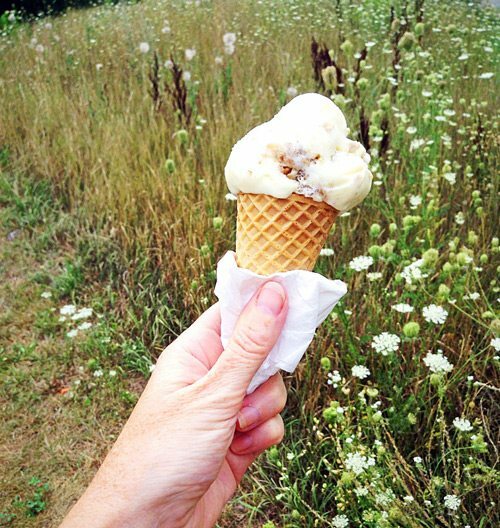 Small-batch ice cream is delightful, just steps from the walking and biking paths leading to Britannia Beach and Mud Lake.